As I've said, I've always known I wanted to be involved in the world of comics (Mission Accomplished!). I learned to read from comics. There was, and is, something about that magic interplay between images and text that appeals to me like no other art form. When comics are done well they work a very specific kind of magic that no other storytelling medium does (and this is where I point out that this is true of every storytelling medium at it's best). But in addition to being a fan of comics, I have always wanted to create them as well, long before I knew anything about the process of actually doing so. My earliest memory of “creating comics” was in church with my grandmother when I was little. I mean really little, like four or five years old little. The memory is vague, of course, but I'm making the assumption that I was fidgeting and bored. She gave me a notepad and a pencil (maybe a pen) to keep me occupied. What I drew is the primary part of the memory, and I'm sure my mind's eye and the many years since have warped the actual visuals, but... I rendered a stick figure rendition of the Fantastic Four. As a child, and on into my teens and adulthood (I still do this...) I filled sketchpads with drawings of superheroes. At first, like so many artists, I copied my favorite drawings from the comics, as well as from other sources (I remember doing a decent reproduction of Sequoia from the cover of one book of a series of American biographies for kids I was devouring from the library at the time. This would have been around third grade). These were not tracings. I would look at the art and draw it freehand. I was determined to someday have drawn every superhero that had ever existed (at the time I had no idea what that would actually entail). Not content with the number of characters that already existed, I also created my own. Lots and lots of them. I think most people who read comics at that age have done something similar. Some of them go on to professional work in comics and introduce characters that had their origins in the brains and sketchbooks of ten-year-olds. I wanted to create my own stories, with my own characters, not simply write what other people have already created. Flash forward to my late teens and early twenties. I met Fred Wheaton around that time and the first thing that bonded us as friends was our mutual love of comics. Thirty years of friendship later, with lots of shared life experiences, comics is still one of the topics we discuss pretty much every time we talk. Fred also drew comics, and wanted to create his own. We very quickly embarked on a series of collaborations. I want to go on record here, and this may embarrass Fred (though this is the least of the embarrassing things I could say here)... Fred has always been a better artist than I am. When I first met him, he was younger than me and as crude as we both know his art was then compared to what it became, he was better than me then. He's better than me now. He has a sense of composition and a surety of line I envy. He simply sees better than I do, and is able to translate what he sees onto the page with more assurance. We co-wrote part of an X-Men/Micronauts crossover and drew a few pages (Marvel actually did this series, much better than we could have done, a year or so later). We started creating characters for other series. We really only had a vague idea of how to go about making comics. In 1981 we attended PittCon '81, our first ever comics convention, and met a lot of comics pros and learned a lot about the process. Scripting, pencilling, inking, layout and design, storytelling. It is a complicated craft and we're still learning it, but that Con connected a lot of the dots for us very early on. Somewhere in there Fred began writing a series of short SciFi prose comedy stories (inspired by Hitchhiker's Guide to the Galaxy) featuring himself and his friends as main characters. They were full of in-jokes and Pop Culture references that no one but a few of us would get today (and don't ask either him or me... you're not going to get to read them). He wrote three and then I wrote a fourth one. 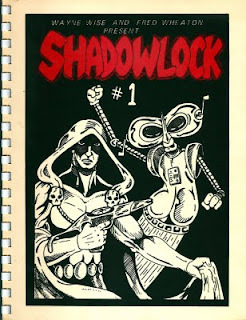 I introduced a ridiculous villain by the name of Shadowlock, the most feared man in the universe. He had a robot companion named 7Q9 and carried the Necroblaster, a gun of limitless and completely undefined power. So of course he became the star of his own comic. We made him a little more serious in tone, though the comedic elements certainly remained. Fred was still in high school at this time, and for some kind of art project we wrote and drew a short story (8 or 10 pages... I don't remember) and printed and bound a few copies. This was the beginning of what would eventually turn into our Grey Legacy universe, the very same universe that my current Brix comic strips (accessible elsewhere on this page) takes place. It has changed a lot over the years. This would have been 1983 or '84. In 1986 we had a contract to do a full-fledged, nationally-distributed comic book series called Shadowlock. Join us next time, same blog channel, for Writing Part 5 (Comics Part 2)! I haven't commented on these entries on writing with anything of substance, but I am really enjoying reading them. Also! We need to make plans to hang out - I have your Make it So to hand over to you! I don't know how much substantive insight I'm achieving here either. Just going through history. It's been a good exercise to line it all up. And yes,hanging out must take place.